Happy Labor Day to my USA friends! Today I’m joining my favorite reading challenge, Readers Imbibing Peril, which is celebrating its 13th year! This entry was posted in Gothic Fiction, Mystery, Paranormal Fiction, Paranormal Romance, Suspense/Thriller, Uncategorized and tagged R.I.P. Reading Challenge. Bookmark the permalink. I’m doing this too – I love the RIP challenge. I’ve never participated, but it sounds like fun. Is it for the month of September? I think it runs through Halloween! Enter your email address to follow Book of Secrets and receive notifications of new posts by email. Happy reading! Hello! My name is Diana, and I’ve been blogging about books since 2010. Fiction is my favorite genre, and I especially enjoy reading suspense/thrillers, mysteries, historical fiction, women’s fiction, and Gothic novels. My review, disclosure, and privacy policies may be found using the top menu tabs. Please find me around the web via the social buttons below. Happy Reading! 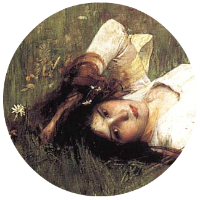 Header painting by John William Waterhouse: Ophelia (Lying in the Meadow), 1889. The Waterhouse paintings I feature on my blog are in the public domain. Please do not copy, re-post, or re-blog content without permission.